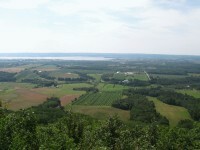 The Annapolis Valley is one of the most scenic regions of Nova Scotia. It is well known for its agriculture, in particular vineyards, and orchards. From the highway and the villages in the valley there are dramatic views of the steep headlands on the coast of the Bay of Fundy. A drive through the valley takes you through several peaceful and quaint maritime towns and villages scattered among the gently rolling hills. If more drama is to your taste you will surely wonder at the surging tides of the Bay of Fundy, one of the natural wonders of the world. Here you can see broad mud flats become quickly submerged by the incoming sea or suddenly revealed as the ocean retreats. Fundy’s unbelievable tides are the highest in the world. From the town of Wolfville in the Annapolis Valley or Grand-Pré a short drive to the north you can watch the twice daily filling and emptying of the Bay of Fundy as tides that can reach up to 16 m (56 ft.) in height surge in and out. You begin your drive through the Annapolis Valley at the town of Windsor. In October Windsor hosts the Pumpkin Regatta where, believe it or not, hollowed out pumpkins are used as boats in an hilarious aquatic competition. The event celebrates the local breeding of the largest pumpkin variety in the world – the Howard Dill Atlantic Giant Pumpkin. Grand Pré is a few minutes from Windsor. Just off the main highway you will pass the Grand Pré Coffee House. This is a great place to stop for refreshments, have a look a small exhibit on Fair Trade Coffee and watch the process of coffee roasting. Then travel on to visit Grand Pré National Historic Site. Costumed guides will explain the life on a typical Acadian farm and tell tales of the tenacity and particular skills employed by the early French settlers in this region. They will explain the building of dykes, the draining of the seawater from the fields and show you how the aboiteau an ingenious one way valve was used to keep the sea from inundating the fields and yet let the fresh water drain out. A stone’s throw from the historic site is the Domaine de Grand Pré a winery with a shop and restaurant. One of their specialities is ice wine. A stop here will be a memorable highlight of your valley drive. 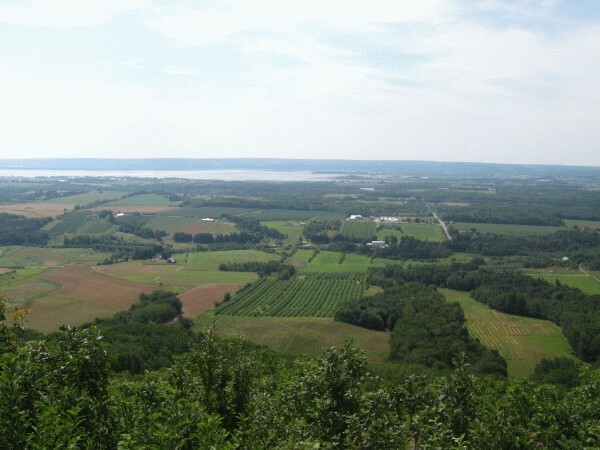 Passing through gently rolling hills and orchards you reach Wolfville, a quaint university town with excellent restaurants and one not to be missed sunset event. A large chimney just back of the main street is the night time home of a flock of swifts. Join the crowd as the sun goes down and keep your eyes on the sky. A huge flock of swifts will suddenly assemble and circle around the chimney. As if following a silent command they all swoop down and disappear into the flue. It’s like a giant vacuum cleaner has sucked them all up for the night. The show, brief as it may be, is a fascinating natural phenomenon. While in Wolfville take a walk on the waterfront where you can hike over dykes and watch the mighty Fundy tides do their magic on the seashore. A drive over to Blomodin, a headland visible from Wolfville, will be rewarded with spectacular views and walk on Blomidon Beach. From here you can proceed on south toward Annapolis and then on to Digby, where you can catch a ferry to Saint John, New Brunswick. In Wolfville there are a number of inns in the massive Victorian homes of the several wealthy 19th century inhabitants of this gem of a town. Staying the night and dining in one of the inn restaurants are special experiences.